When the third X-Files novel hit print in December 1995, it was in a wildly different landscape than before. The show was a booming pop culture phenomenon. A cheap paperback by a washed up pulp writer whose reputation would only emerge post-mortem wouldn’t do. It was time to go big. 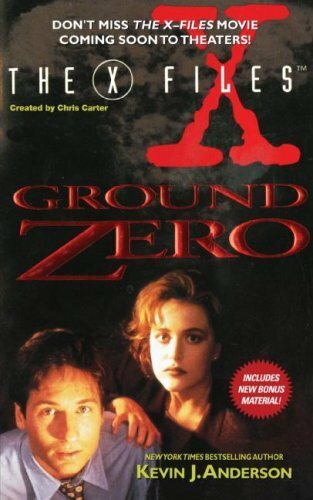 The X-Files: Ground Zero is the definition of a “big” tie-in. It feels like an event with the hardcover release, best selling author Kevin J. Anderson writing, an audiobook read by one of the show’s stars (Gillian Anderson), and even in time a comic book adaptation. It’s almost the show’s answer to Shadows of the Empire. It’s also a timely book, hitting the year of the 50th anniversary of the dropping of the atomic bomb. It’s “important” but is it good? The book focuses on Mulder and Scully investigating a bizarre string of deaths where the victims seem to have died in atomic blasts. What they find leads them to the ghosts of nuclear tests past and present. It also ends in a third act set far outside FBI jurisdiction that really wouldn’t make it to a TV budget. Before I get into my thoughts on this book, I want to point out that with one exception, I’m rereading all of these for the first time in 18-22 years. Thus my views on the books are often different than on first read. I liked Goblins way more at 12 than I did at 34 and Whirlwind way less. Ground Zero is the exception. I’ve read it a few times over the years including just last year. Thus my thoughts are basically the same. I think it’s a killer X-Files novel having fun with a big budget to tell a story. Anderson just plain gets this material. At this point he had plenty of material to work from and he has fun with it. Mulder and Scully are the peak versions of themselves here. The atmosphere is solidly creepy as the show goes. He also gets the proper pacing of a good episode, bouncing between other stories and Mulder and Scully just enough. However the thing he gets most right is the world it’s set in, which he should. He worked in a national laboratory. It feels real. The book does genuinely feel big too. It’s longer than the first two books and it uses that space well. There’s time to let scenes build and the tension to escalate, vital in a horror story. Then in the third act it just gets absurd with Mulder and Scully leaving the U.S. to witness a nuclear test. I strain to buy them getting to this but oh well. If there is one flaw, it’s :sigh: the racism. The nuclear blasts are revealed to be the revenge of a mystical survivor of a nuclear test. The 90s were big on dealing with atrocities–and Hiroshima/Nagasaki indisputably constitute war crimes in my eyes–by making the other cultures all powerful magical creatures. That’s not ideal! This is something I have to deal with as I go back through older works. Overall though I still dig this book. It’s a mere $.99 on Amazon Kindle so if you’re even a mild fan, pick it up. The X-Files was huge at this point. It would only get bigger. Next time it gets absurd.